The SD-10G is a 2.4G 10-ch high-performance digital proportional computer radio-control system designed to give both sport and competition pilots a radio that is easy to use, powerful, flexible and yet very affordable. Using the Airtronics reliable 2.4G FHSS-3 technology with Safety Link, the SD-10G is ideally suited for competition fixed-wing aircraft, sailplanes and helicopters. The SD-10G features 10 channels, a 10-bit computer and is as much as 10 times faster as some older competition systems. Featuring bullet-proof FHSS-3 (Frequency Hopping Technology), Airtronics 2.4G has already gained a reputation as a no-hassle, reliable spread spectrum solution, earning Airtronics/Sanwa Engineers, the nick-name "The 2.4G Specialists". The SD-10G was developed by Sanwa's best and brightest computer programmers in concert with the most experienced pilots from Sanwa Japan and Airtronics USA. From F3J World Champions to 3D Helicopter Experts, from AMA Hall-of-Famers to Pattern Nats Champs, the team who planned and put together the SD-10G are some of the most dedicated and experienced modelers in the world today. They have worked with pilots for more than an year to ensure every detail, every nuance was developed for the modeler, both sport and competitor. You'll find the SD-10G is incredibly user-friendly and easy to setup, yet allows flexibility not found even in radios at twice the price. Sport pilots will find their model easy to set up. Advanced pilots will love the customizable features that truly make this radio unique. As modelers, we know high-performance is not free, but the team at Airtronics worked hard to ensure the SD-10G offers both industry leading performance and value. And the SD-10G is fast. In our side-by-side tests - we found no other 9- or 10-ch radios to be faster. The Sanwa high-speed computer chip works with its unique high-performance 2.4G RF chip to ensure inputs are translated at industry-leading speed to the servos. Your servos will feel faster, the radio will respond quicker and you'll wonder how you ever did without. We could go on and on, but let's make it quick and easy. Whether you fly for sport or compete at the highest levels in categories such as F3J Sailplanes, Pattern, IMAC, Scale, Indoor Foam, Micro Helicopters, or 3D (and that's heli or plank) you'll get the Advantage. You will see there has never been a radio like this in our hobby, a radio this advanced, this reliable and this fast. And remarkably, you will find the SD-10G truly affordable. *The SD-10G features a Trainer System that is compatible with all Airtronics SD series transmitters. The SD-10G is absolutely the FASTEST radio in its class. The faster the latency, the quicker your model reacts to your control inputs and the more connected you feel to your model. These latency findings were taken using carefully contructed and consistent methods to ensure they are as accurate as possible*. The receiver's nominal input voltage is 4.8-7.4v, therefore, the receiver can be powered using a 4- to 6-Cell NiCd or NiMH battery pack, or a 2S LiPo or 2S A123/Li-Fe battery pack. DO NOT USE A 3S Li-Po! No servos are included. Analog or Digital servos can be used, although we highly recommend using Digital servos (see below*). We recommend using Airtronics servos that are within the specification range required for your model. *When using the SD-10G with an FHSS-3 receiver, it simply may be too fast for some analog servos. They simply may not work. To truly see the advantages of this high-resolution, high frame-rate, low-latency radio, you'll need digital servos. 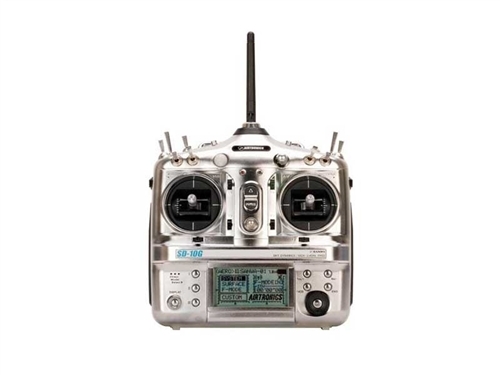 If you are using analog servos and experience problems with the 10-ch receiver, and you don't have digital servos to replace them yet, that's OK, just use one of the Airtronics 2.4G FHSS-1 full-range receivers available. These receivers ALL work GREAT with the SD-10G and are 100% compatible with analog servos.